CenturyLink is an internet and telecommunications company that has work at home and telecommuting opportunities. Based in Monroe, Louisiana, CenturyLink (formerly CenturyTel and EMBARQ) is a provider of broadband, hosting, cloud, IT services, entertainment services, and voice services to consumers and businesses in 33 states. CenturyLink jobs include work-at-home call center positions. In 2016, they were at position number 159 on the Fortune 500 and rising, with 43,000 employees. It's the third largest telecom behind AT&T and Verizon. Find a Call Center Job in Your State or a Call Center Job in Canada. 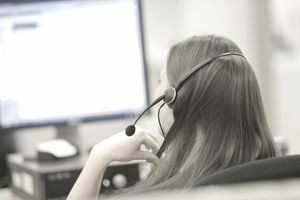 Call center agents may perform technical customer service or be part of a virtual sales team. CenturyLink provides a base pay with sales incentives available. Bilingual agents are encouraged to apply. Work-at-home agents are typically hired as temporary employees, and no benefits are provided at that time. When, or if, an employee becomes a permanent, benefits are available. CenturyLink has a variety of benefits for permanent employees, including pre-paid tuition, healthcare and daycare spending accounts, medical, dental, and vision insurance, 401K match, paid holidays and continued training. See more employment call center jobs with benefits. Work at home agents is required to provide their own computer, purchase a specific headset and use CenturyLink's telephone service. However, the phone line does not have to be a dedicated line that is separate from the home line. They must have a traditional landline/analog telephone system and subscribe to a high-speed internet service with the PC physically connected to a modem/router with an Ethernet cable. You must have arrangements for child care and ensure that pets cannot be heard in your work environment. See more of the typical office requirements for home call centers. There are other careers at CenturyLink that qualify for telecommuting agreements. These aren't included under their "work from home" category. In order to apply for CenturyLink jobs, go to the CenturyLink Jobs page. Enter "work from home" in the job search bar to see positions that are currently available. You then set up a profile using your LinkedIn, Facebook, or email. Applicants must take an online "job-fit assessment" immediately after applying. This takes approximately 25 minutes to complete. They participate in the A-Check Pre-employment Screening Program or the Electronic Employment Verification Program depending on location. In the U.S., they participate in eVerify. For more telecommuting jobs, see this directory of work-at home-companies. For more profiles like this, see these work-at-home call center company profiles. Advertisements for work at home jobs or business opportunities placed on this page in the section labeled "Sponsored Links" or elsewhere are not necessarily legitimate. These ads are not screened by me but appear on the page due to having similar keywords to the text on the page. Learn more about the home-based jobs medical BPO Accentus offers.